Written in the midst of the nuclear arms race and the Cold War, John XXIII’s landmark encyclical contains important messages for our world today. On April 11, 1963, The Beverly Hillbillies was the top television show in the United States, works by J. D. Salinger and John Steinbeck topped the fiction and nonfiction bestseller lists, and the lead headline in the New York Times was “Atom Submarine with 129 Lost in Depths 220 Miles Off Boston; Oil Slick Seen Near Site of Dive.” The Chiffons’ “He’s So Fine” was the nation’s most popular song; It Happened at the World’s Fair, starring Elvis Presley, was the most popular movie. 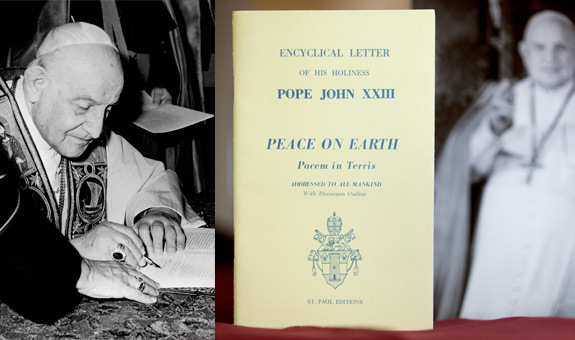 And Blessed John XXIII issued Pacem in Terris (“Peace on Earth”), the first papal encyclical addressed not only to the Catholic faithful, but also to all men of good will. Blessed John wrote his encyclical letter de pace omnium gentium in veritate, iustitia, caritate, libertate constituenda, according to the encyclical’s Latin title—“about establishing the peace of all nations in truth, justice, charity, liberty,” or as the phrase is more loosely rendered in the most popular English version, “on establishing universal peace in truth, justice, charity, and liberty.” The official Latin version appears in Acta Apostolicae Sedis (beginning on page 257); the Vatican website’s Latin version contains additional notes and at least one Latin error that did not appear in the original. The official version contains five untitled sections with unnumbered paragraphs. The Italian version contained section titles, subsections, and subsection titles where none exist in the official Latin text. The translator of the most popular English version, which originally appeared in the publication The Pope Speaks, incorporated these Italian additions, while the translator of another English version, found here, did not. This latter English translation has the advantage of adhering more closely to the Latin in the body of the encyclical; unfortunately, it does not retain the original division into five sections, thus making the encyclical appear less structured than it is really is. By these laws [in human nature] men are most admirably taught, first of all how they should conduct their mutual dealings among themselves, then how the relationships between the citizens and the public authorities of each state should be regulated, then how states should deal with one another, and finally how, on the one hand individual men and states, and on the other hand the community of all peoples, should act towards each other, the establishment of such a community being urgently demanded today by the requirements of universal common good (no. 7). Thus, the first section examines the order among men; the second, the relation between citizens and public authorities; the third, the relation between states; and the fourth, the relation of individuals and states to the world community. The fifth section consists of pastoral exhortations. Reaction to the encyclical was widespread and favorable: it was immediately hailed by sources as diverse as the US State Department and the European Communist press. Pacem in Terris “is not just the voice of an old priest, nor just that of an ancient Church; it is the voice of the conscience of the world,” stated the Washington Post – praise reflected in other editorials of the day. The fact that the encyclical attracted so much notice beyond Catholic circles in itself made an impression on American Catholics, even those who were not ordinarily standing by their mailboxes waiting for the latest word from Rome. No doubt the timing had much to do with its impact. The Cold War was at its height, and the world had been shaken by the Cuban missile crisis the preceding fall. But Pacem in Terris also spoke to the momentous changes that were taking rise in America. It made a huge impression on young Catholics like myself who were beginning to be active in the civil rights movement. It was exciting that the Pope himself seemed to be encouraging our causes. His emphatic insistence that “racial discrimination can in no way be accepted,” his affirmation of women’s roles and rights in contemporary society, and his praise for the Universal Declaration of Human Rights—all those things contributed to our sense of being on the cusp of historic changes, and gave us a sense of pride that our Church’s leaders were in the forefront. Lest we forget: the previous year Archbishop Joseph Francis Rummel of New Orleans had excommunicated three powerful Louisiana political figures for opposing the desegregation of schools. It felt like a great time to be a Catholic! Blessed John’s encyclical has exercised a profound impact on subsequent Catholic teaching. The Catechism of the Catholic Church quotes the encyclical in its teaching on conversion and society (no. 1886) and authority (nos. 1897 and 1903) and cites the encyclical in its teaching on respect for the human person (no. 1930). The Compendium of the Social Doctrine of the Church (2004) quotes the encyclical 16 times and offers 34 additional citations. Each social encyclical written after Pacem in Terris has cited it. In 2003, Blessed John Paul II referred to the 40th anniversary of Pacem in Terris at least nine times, offering his most extensive reflections in his Messages for the World Day of Peace and World Communication Day. Archbishop Celestino Migliore, then the Vatican’s chief representative at the United Nations, also delivered an address on the encyclical that year. Pope Benedict XVI described Pacem in Terris as an “immortal encyclical” in a 2006 Angelus address and referred to it at least five times during the last year of his pontificate. Likewise, Pope Francis mentioned the encyclical in an address to the Papal Foundation delivered the day of its 50th anniversary. Pacem in Terris became the subject of renewed interest in view of its 50th anniversary. In 2012, the Pontifical Academy of Social Sciences devoted its plenary session to it; the proceedings included notable contributions by coeditors Mary Ann Glendon and Russell Hittinger, as well as reflections by ecclesiastical, academic, cultural, and political dignitaries, including Lord David Alton, who reflected on Pacem in Terris and globalization, and Janne Haaland Matlary, who spoke on human rights. In recent months, the University of Notre Dame, the Catholic University of America, and Georgetown University have hosted conferences on the encyclical. At the conference at Catholic University, Cardinal Peter Turkson, president of the Pontifical Council for Justice and Peace, discussed Catholic peacebuilding, and Bishop Richard Pates of Des Moines, chairman of the United States Conference of Catholic Bishops’ Committee on International Justice and Peace, spoke about solidarity and American foreign policy. In Pacem in Terris, Blessed John cited Sacred Scripture, St. Augustine, St. Thomas Aquinas, and Popes Leo XIII, Benedict XV, Pius XI, and Pius XII. CWR asked scholars and other Christian leaders who have reflected on the encyclical to discuss the most important ways in which the encyclical developed the tradition of Catholic social teaching in which it is rooted. Marie Dennis, co-president of Pax Christi International and speaker at the Catholic University conference, told CWR that “one of the most interesting topics Pope John XXIII addressed in Pacem in Terris was the inadequacy of the modern state to ensure the universal common good (nos. 137-38). At the same time, Pacem in Terris emphasizes the right role of government based upon the principle of subsidiarity. The relevance of this concern about global political authority today was reiterated by Pope Benedict XVI in Caritas in Veritate,” his 2009 social encyclical. Press coverage of Pacem in Terris in April 1963 focused almost entirely on the encyclical’s discussion of nuclear weapons (nos. 109-119). What is most significant about the encyclical with the passage of five decades? Because Pacem in Terris was addressed to all “men of good will,” CWR asked the president of the National Association of Evangelicals to offer reflections on the encyclical.